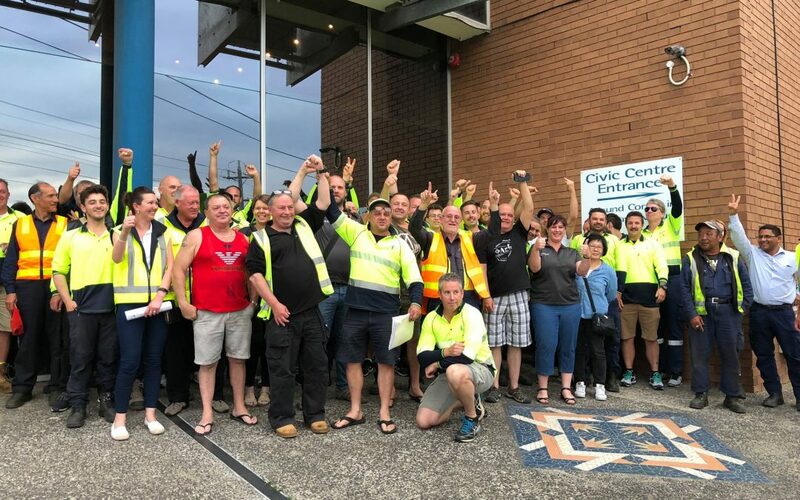 In what was a triumph of common sense over impulsive and ill-conceived decision making, ASU members working at the Moonee Valley City Council Depot breathed a sigh of relief when Councillors unanimously voted up a motion ending current lease negotiations which would have relocated their Depot outside the municipality. Council officers had attempted to bulldoze the collective opinions and expert knowledge of workers at the depot throughout the very short and poorly executed plan to begin leasing a site in Tullamarine Park Road, which would have needed over $2.5million spent just to get it ready to use. However their plans came to an abrupt halt when not a single one of the Councillors present at the Council Meeting were convinced about the suitability of the site, or that there had been nearly enough work done in the search for a suitable alternative to the depot’s current location on the Maribyrnong river. Councillors did note that there was a good chance the depot would need to be relocated, but didn’t accept that it needed to be rushed into, didn’t accept that this was the best Council could manage to find, and didn’t just disregard the combined expertise and passion of the 70+ workers at the depot who vocally opposed the proposal. Over 60 ASU members came to the Council meeting to show their concern about the relocation and watch Council make this critical decision about the future of their workplace and of service delivery within Moonee Valley. ASU delegates and members who knew this was a terrible decision have been advocating for an alternative proposal over the last couple of weeks, and telling Councillors and Moonee Valley City Council CEO that the proposal needed to be blocked. During an ASU meeting on the morning of the Council meeting, a resolution was unanimously passed by 70 Union members calling on Councillors to oppose the proposal to relocate the depot, and that’s exactly what they did! The ASU, on behalf of all the fantastic members and delegates at Moonee Valley City Council, congratulate the Councillors (particularly Cr Marshall who moved the motion and spoke strongly about the value of the work Council employees do and the importance of listening to the opinions of affected staff) for blocking this outrageous proposal. We hope that Council officers will now see the importance of listening to and respecting the views of the workers and their Union. ASU members coming out in force to bear witness to Council decisions is an important aspect of holding Councils accountable for the impact of their decisions on workers and the communities they serve. It was great to see members from other areas come out in support of the depot members, a sign of solidarity to be encouraged across all Councils and the Local Government industry.